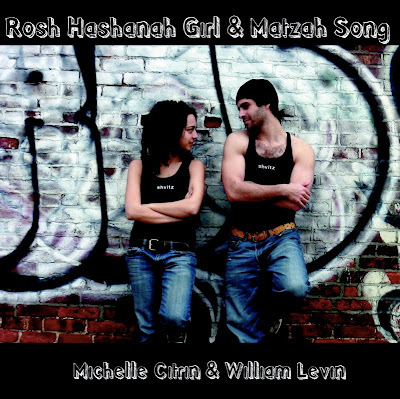 Exactly one year ago, Michelle Citrin and I released our first music video together, Rosh Hashanah Girl. Now you can purchase and download the song, "I Gotta' Love You Rosh Hashanah", along with our second holiday hit, "20 Things To Do With Matzah", together in a double release, aptly titled "Rosh Hashanah Girl & the Matzah Song". Now, what the Jewish Advocate calls, "The best parody songs since Adam Sandler's 'Chanukah Song'" are available for download on your iPod with the release of their double hit album "Rosh Hashanah Girl and Matzah Song", so you can listen all year round! If you love Rosh Hashanah Girl (who doesn't? ), show your support for the artists and download the songs from CD Baby!